Since I run my Media Center PC 24x7, I decided it would be a good idea to capture log messages from the DFL-210 firewall, my 2 Linksys access points and the SunRocket Innomedia VOIP gateway. I found the Kiwi Syslog Daemon to fit my needs since it worked with all my devices and they provide a freeware version. The Kiwi Syslog Daemon can be run as a service so you do not need to be logged on. You should also download the Kiwi Log Viewer to view the entire log file, the Syslog Daemon will only display the last 100 entries or so. 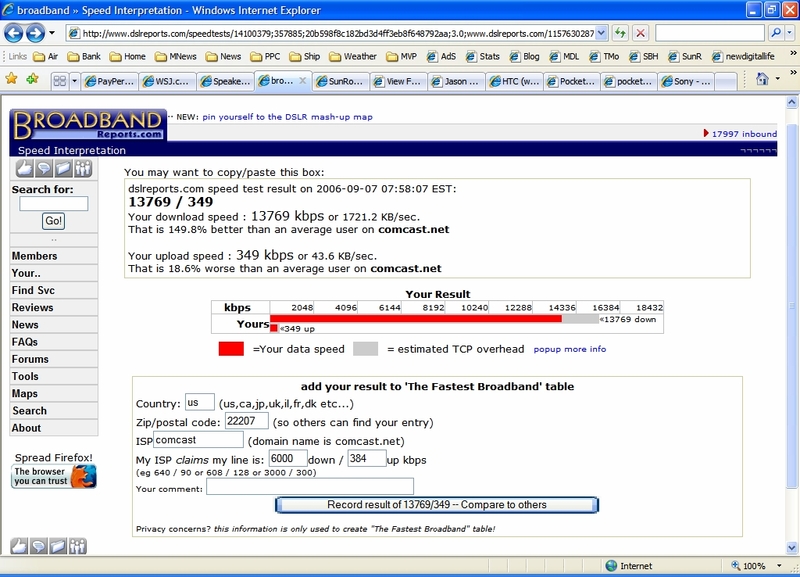 The key differences that I can between the paid and the freeware version is the ability to filter , better reports and DNS resolution of logged IP addresses. You can request a 30 day trial of the paid version. I may try it once I know my way around the software. The DFL-210 is configured by adding a Log and Event Receiver under System. 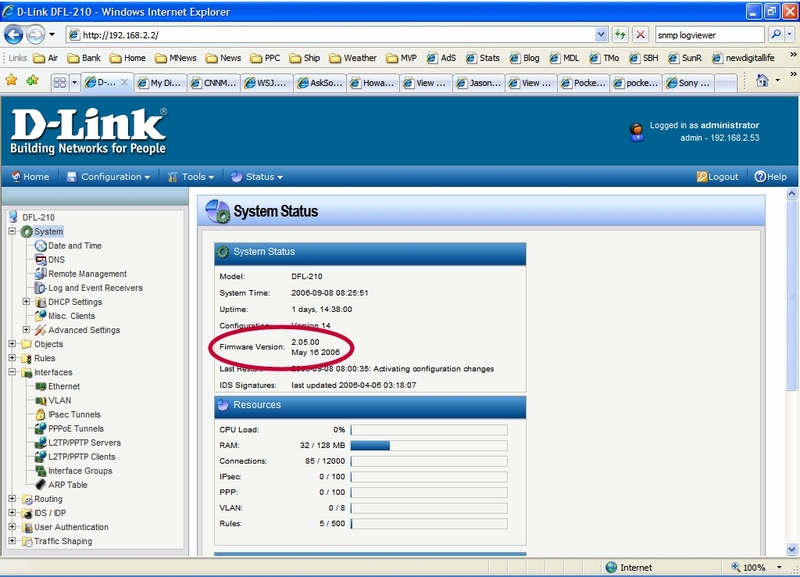 In the Kiwi Syslog Daemon setup enable Inputs/UDP and if you have Linksys equipment enable Inputs/SNMP. When you set up new items or rules on the DFL-210 you can manually set the logging options. Next I need to look at filtering and reporting to see if the paid version might be useful for my use. In order to enable port forwarding you need to create two rules on the DFL-210. The first rule is for service to Static Address Translation (SAT) and the second rule is for Network Address Translation (NAT) to Static Address Translation. Create the rule by clicking OK.
Activate the configuration by using the Configuration/Save and Activate menu item. The D-Link DFL-210 is not a plug and play router. The router is not setup for DHCP, you must first assign a static IP address of 192.168.1.2 and a gateway of 192.168.1.1 on your PC's wired Ethernet adapter. To access the administration UI you connect via IE to 192.168.1.1. You should then check that you are running the latest firmware. 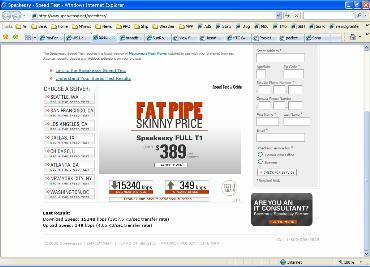 As of 9/8/06 version 2.05 was the newest available. You can download the latest from D-Link and use the tools/upgrade menu item. This is a straight forward process. The default configuration comes with basic firewall rules that block all inbound traffic and allow outbound traffic via the 4 lan ports. The DMZ port is blocked. 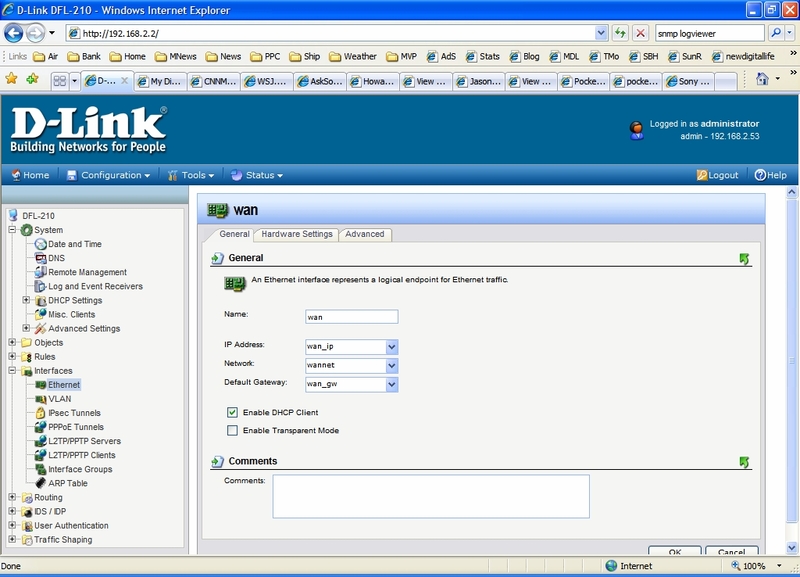 There are two elements to configure; the WAN interface, and DHCP. The WAN interface under Interfaces/Ethernet/wan needed to be setup as a DHCP client for my Comcast connection by checking the Enable DHCP Client box. For every configuration change you then need to use the Configuration/Save and Activate menu item. I also found that the router should be up running before the Motorola cable modem is activated for the connection/address acquisition process to work. If you have static DNS entries setup on your PC's Ethernet you should be able to access the Internet at this point. If you want to use DHCP to assign IP addresses and DNS entries on your network you need to setup a DHCP server. A default object called lannet is already setup for a pool of addresses (192.168.1.0 - 192.168.1.24) that you can use for DHCP. 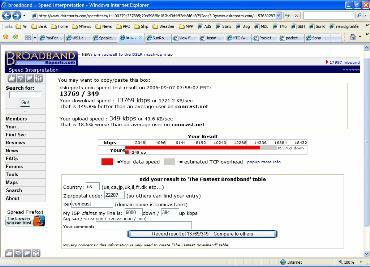 This object is also used in the lan to wan rule, with this rule the firewall only allows outbound traffic within this IP address range. I create a new object called DHCP_Pool since I have devices on my network with fixed IP addresses. Unfortunately the DHCP server does not have the ability to assign IP address based on MAC address, this is a major omission given that most sub $50 routers have this feature. I have an email out on the subject to D-Link support but no response yet. 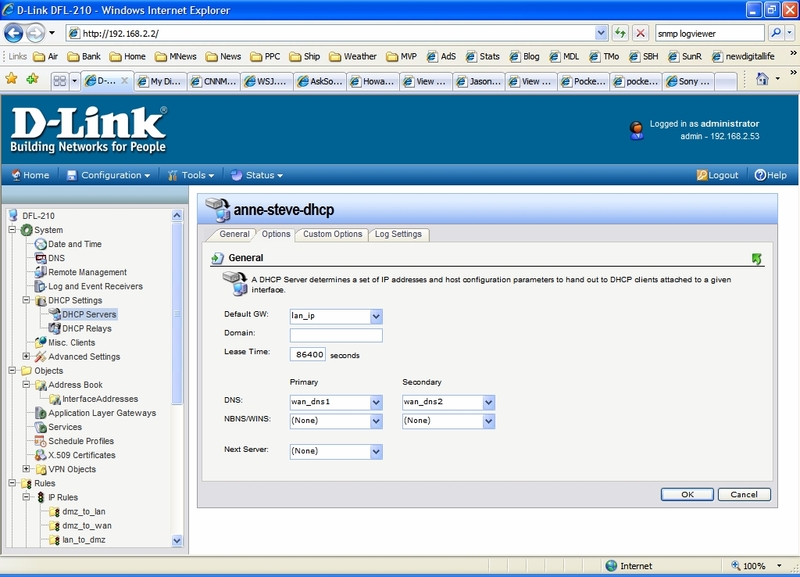 The first configuration screen for DHCP. The DHCP options tabs provides fields for specifying domain name, DNS and WINS entries. 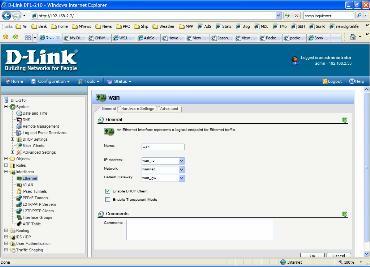 Since the router does not understand DNS, you must use an external DNS server (unless you run your own) such as the one gathered by the DHCP client on the wan interface. There are two default object, wan_dns1 and wan_dns2, that can be used to pass the external DNS servers to your clients. This should get basic firewalled connectivity up and running. Next up; bandwidth management with pipes and pipe rules..
After 3 weeks of waiting, I received my D-Link DFL-210 SOHO router from costcentral.com. I paid $298 + shipping which I consider high for a home office router, however the list of features was impressive and I wanted bandwidth management to place my Innomedia VOIP router behind it. My two initial impressions are: WOW and this is not a consumer grade device. 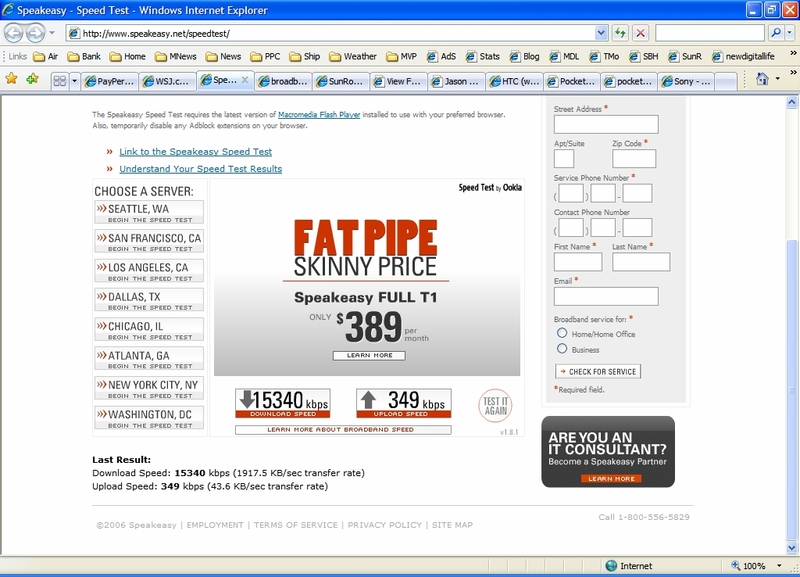 speakeasy.net's test 15340Kbps down and 349Kbps up. dslreports.com test 13769Kpbs down and 349 up. 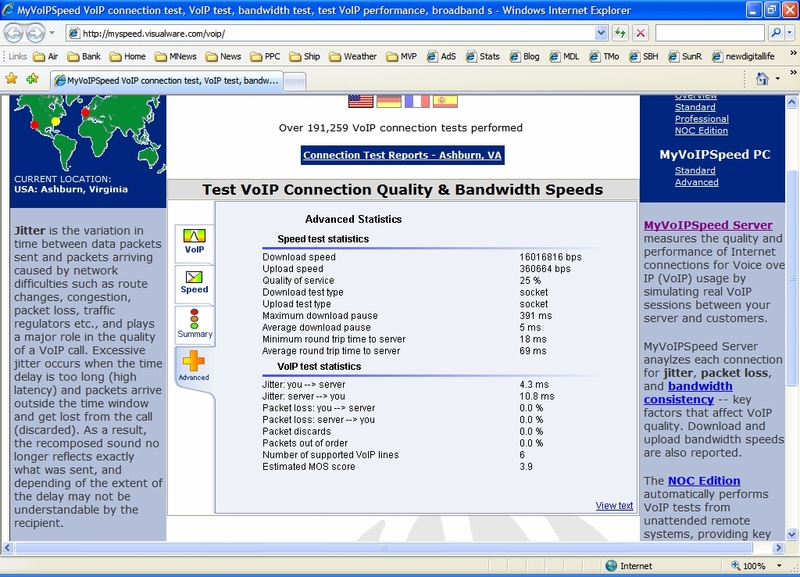 visualware.com VOIP test 16016Kbps down and 360Kbps up. It showed QOS test of 25% which is not good for VOIP, I am not sure this value is accurate since I am not having any problems with my SunRocket VOIP connection.